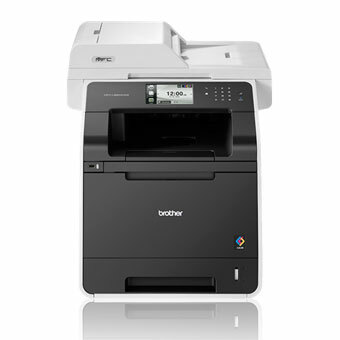 Colour Printing, Copying, Faxing, Colour Scan, Networking (Wired/Wireless), Duplex Double sided (Print/Copy/Scan), Brother iPrint&Scan, Air Print, Google Cloud Print, Web Connect, Brother Apps Fast print speeds up to 30ppm (A4) for colour laser printing Hi-Speed USB2.0 / USB Direct Print / Ethernet / Wireless 4.85″ Touch Screen Colour LCD Super High Yield 6,000 pages yield toners offering a low cost per page. Take your business efficiency to the next level with the Brother high-speed colour laser machines. Featuring Dual CIS scanner which scans 2 sided documents in a single pass, saving your time with minimum paper jams and faster scanning speed. When everything is due yesterday, Brother’s MFC-L8850CDW helps you deliver on deadlines and meet your customers’ demands with high-speed colour laser printing at 30ppm, for both colour and monochrome, in A4 format. Handle the biggest jobs and get the best results with super-high, 6,000 page yield* toner cartridges that last longer and produce high quality prints. Plus, save time and money with fewer replacements and lower your overall printing cost. Achieve greater control over group usage with Secure Function Lock 3.0. It allows setting of colour page counts or authorisation of monochrome and colour printing for up to 100 users. Eliminate excessive downtime with Brother networking administration tools(BRAdmin Professional Software) which provides status monitoring and configuration capabilities.